Antenna Music‘s soloist Sam Kim has just released the track list for his first full album ‘Sun and Moon‘. There are two parts to this album, and part one will be released on October 23rd. He made his official debut two years ago on March 28th 2016 with his debut EP ‘My Name is Sam‘. Check out Sam Kim’s track list for part 1 of ‘Sun and Moon’ below! Part 1 of ‘Sun and Moon‘ contains three tracks, with the title track being ‘Make Up‘ featuring Crush. The track list also shows the details of each track, including who composed, arranged, and wrote the lyrics for the song. In the track list image, we see Sam‘s side-profile against a blue sky and desert background. 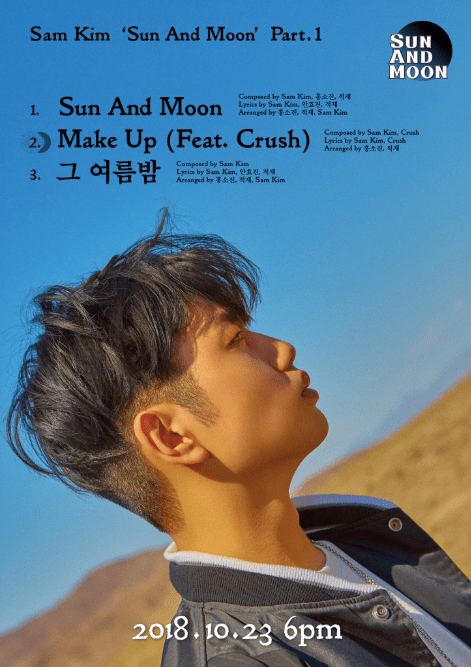 What do you think of Sam Kim‘s track list for part 1 of ‘Sun and Moon’? Let us know in the comments below!